The novel that turns the Catholic Church clergy abuse scandals upside down through the voice of an unforgettable character. “Skillfully written and chilling” is how Staige Blackford, long-time editor of the Virginia Quarterly Review, described “The Holy Mark,” the short story on which Gregory Alexander’s stunning debut novel is based. Father Tony probably should have never been a priest. With his family’s money, courtesy of ties to the New Orleans mob, he could have pursued his interest in literature or even worked with young boys—only free of all those silly Church strictures. But there was no priest in the Miggliore family, much to the shame of his immigrant Italian grandmother. So at his birth, when the old woman beheld a peculiar mark on his head and declared it to be a sign from God—a “segno sacro” in the only language she knew—this grandson’s destiny was set. 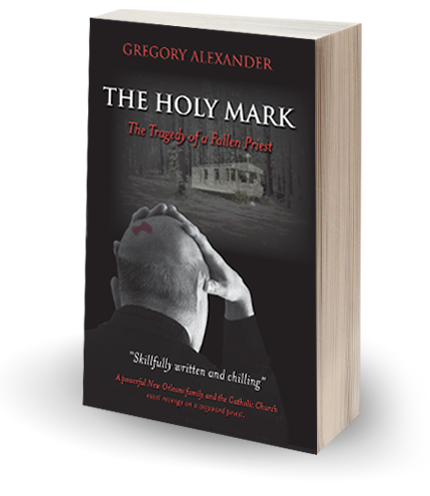 A shocking novel of family, power, and revenge, The Holy Mark is the story of one reluctant priest caught between the cynicism of his own Southern upbringing and the political machinations of the Roman Catholic Church. An Underground Book Reviews 5-Star “Top Pick”!